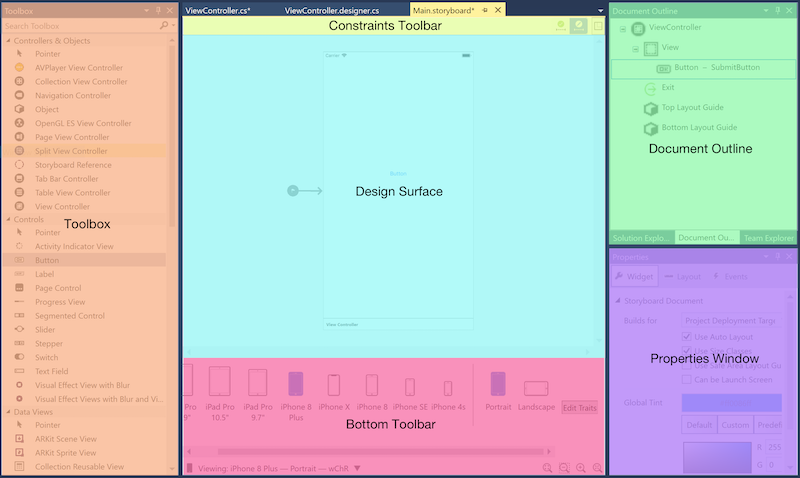 This guide introduces the Xamarin Designer for iOS. 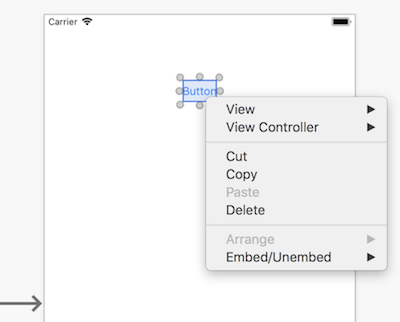 It demonstrates how to use the iOS Designer to visually lay out controls, how to access those controls in code, and how to edit properties. 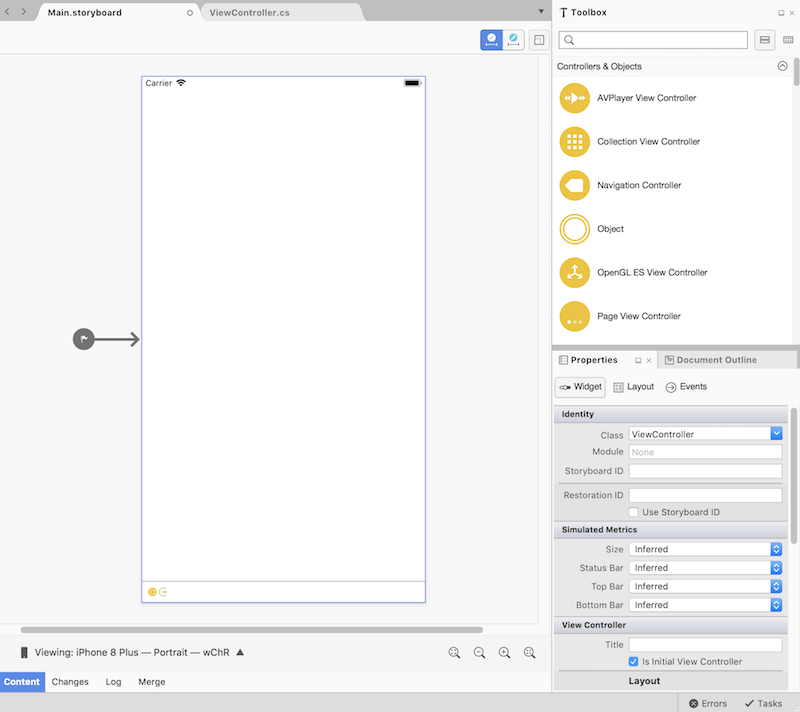 The Xamarin Designer for iOS is a visual interface designer similar to Xcode's Interface Builder and the Android Designer. 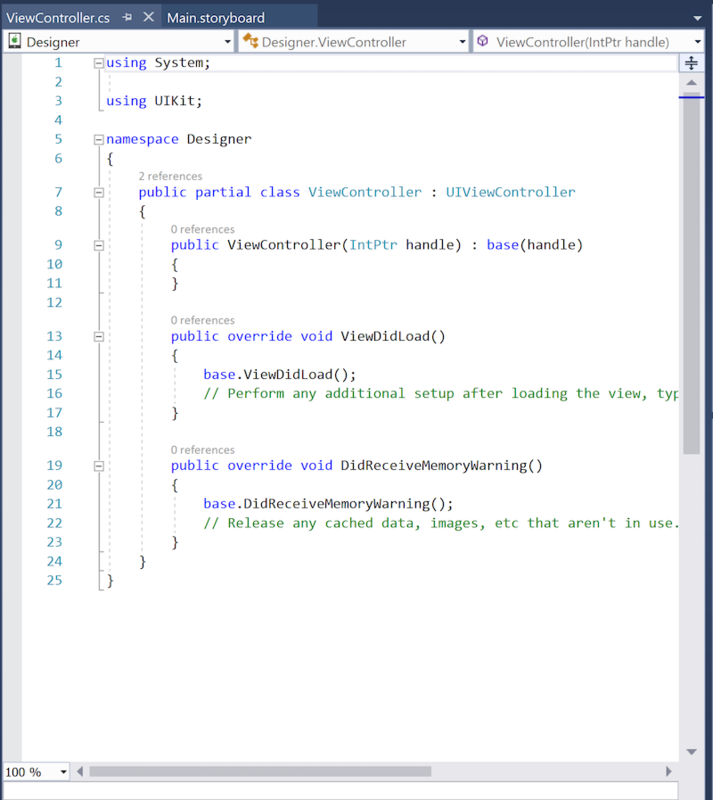 Some of its many features include seamless integration with Visual Studio for Windows and Mac, drag-and-drop editing, an interface for setting up event handlers, and the ability to render custom controls. 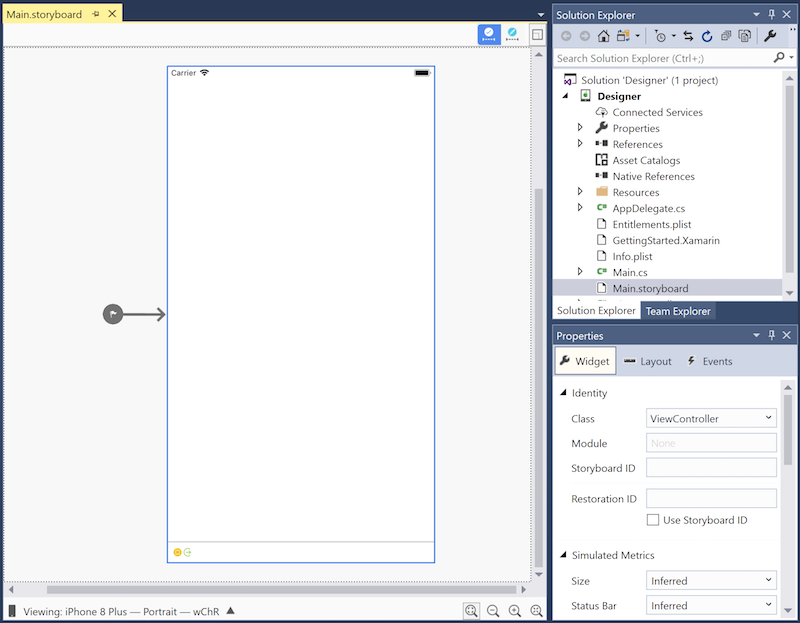 The iOS Designer is available in Visual Studio for Mac and Visual Studio 2017 and later on Windows. In Visual Studio for Windows, the iOS Designer requires a connection to a properly configured Mac build host, though Xcode need not be running. This guide assumes a familiarity with the contents covered in the Getting Started guides. This section describes how the iOS Designer facilitates creating a user interface and connecting it to code. The iOS Designer allows developers to visually design an application's user interface. 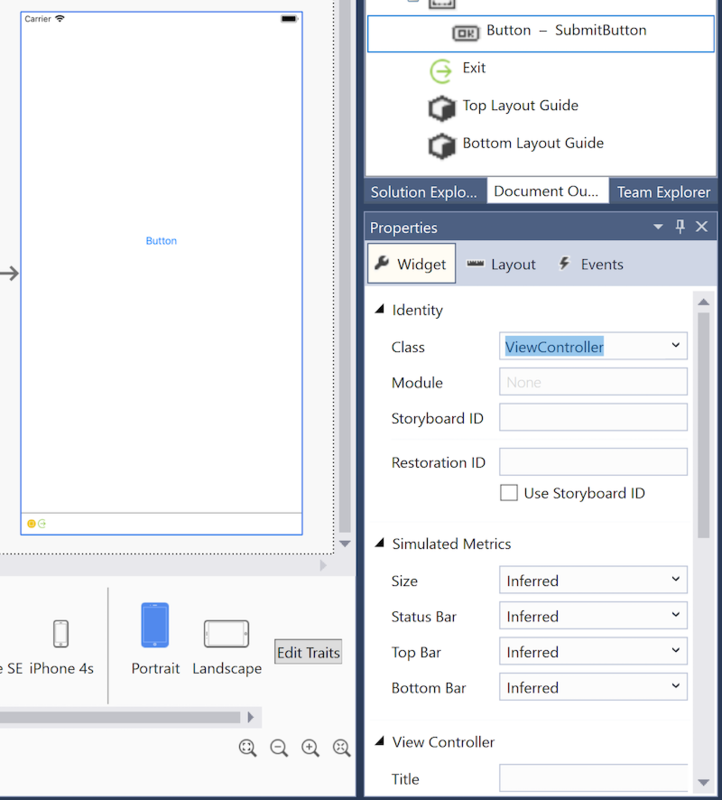 As outlined in the Introduction to Storyboards guide, a storyboard describes the screens (view controllers) that make up an app, the interface elements (views) placed on those view controllers, and the app's overall navigation flow. Some controls, such as labels containing static text, can be added to the view controller and left alone. However, more often than not, controls must be customized programmatically. For example, the button added above should do something when tapped, so an event handler must be added in code. Now that the button has a name, it can be accessed in code. But how does this work? 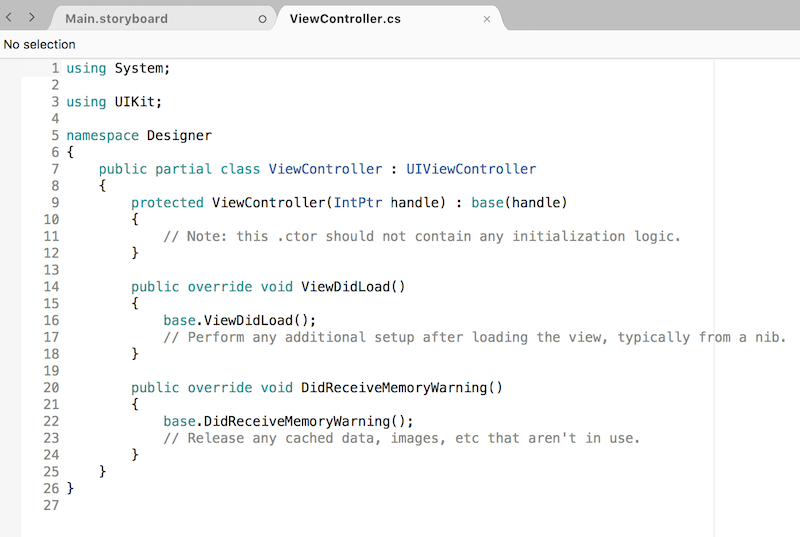 ViewController.cs should be populated with custom code related to the ViewController class. 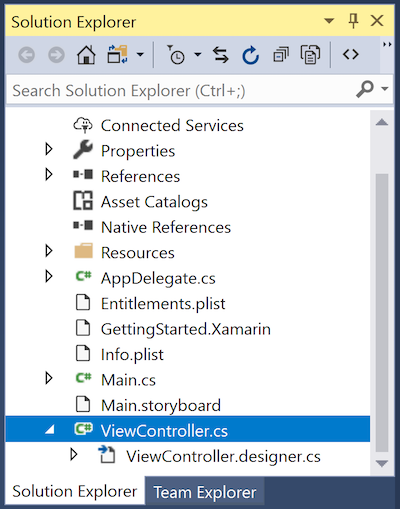 In this file, the ViewController class can respond to various iOS view controller lifecycle methods, customize the UI, and respond to user input such as button taps. The SubmitButton property declaration connects the entire ViewController class - not just the ViewController.designer.cs file – to the button defined in the storyboard. Since ViewController.cs defines part of the ViewController class, it has access to SubmitButton. This section has demonstrated how create a button in the iOS Designer and access that button in code. The remainder of this document provides a further overview of the iOS Designer. This section introduces the parts of the iOS Designer and provides a tour of its features. 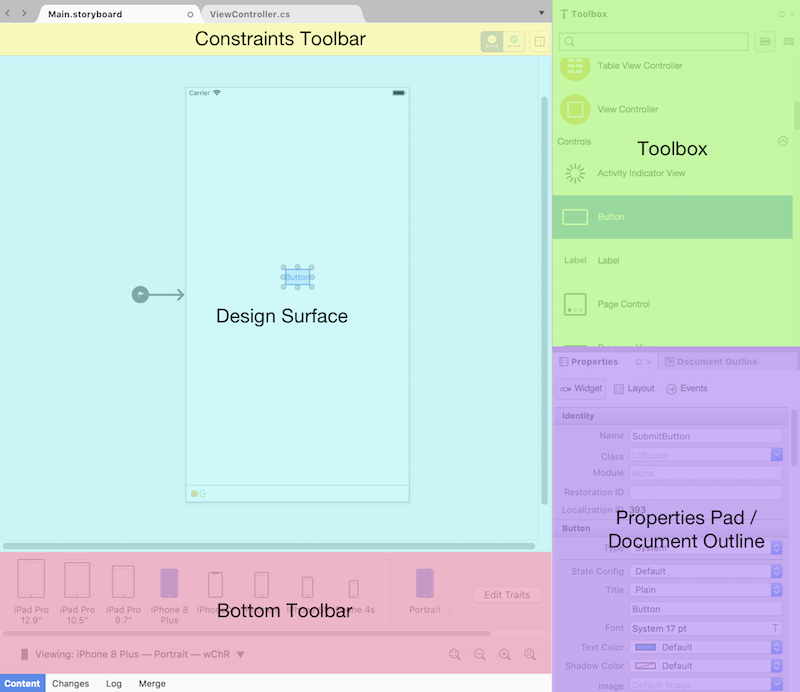 Design Surface – The iOS Designer's primary workspace. Shown in the document area, it enables the visual construction of user interfaces. Constraints Toolbar – Allows for switching between frame editing mode and constraint editing mode, two different ways to position elements in a user interface. Toolbox – Lists the controllers, objects, controls, data views, gesture recognizers, windows, and bars that can be dragged onto the design surface and added to a user interface. Properties Pad – Shows properties for the selected control, including identity, visual styles, accessibility, layout, and behavior. Document Outline – Shows the tree of controls that compose the layout for the interface being edited. 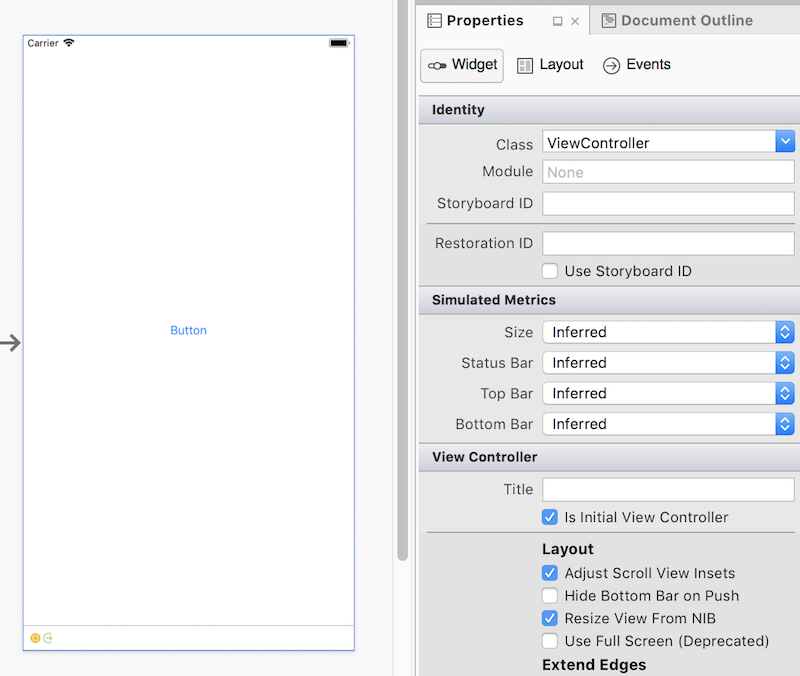 Clicking on an item in the tree selects it in the iOS Designer and shows its properties in the Properties Pad. This is handy for selecting a specific control in a deeply-nested user interface. Bottom Toolbar – Contains options for changing how the iOS Designer displays the .storyboard or .xib file, including device, orientation, and zoom. Properties Window – Shows properties for the selected control, including identity, visual styles, accessibility, layout, and behavior. Document Outline – Shows the tree of controls that compose the layout for the interface being edited. Clicking on an item in the tree selects it in the iOS Designer and shows its properties in the Properties Window. This is handy for selecting a specific control in a deeply-nested user interface. The blue dotted line in the example above provides a horizontal center visual alignment guideline to help with the button placement. The constraints toolbar has been updated and now consists of two controls: the frame editing mode / constraint editing mode toggle and the update constraints / update frames button. In previous versions of the iOS Designer, clicking an already-selected view on the design surface toggled between frame editing mode and constraint editing mode. Now, a toggle control in the constraints toolbar switches between these editing modes. The update constraints / update frames button sits to the right of the frame editing mode / constraint editing mode toggle. In frame editing mode, clicking this button adjusts the frames of any selected elements to match their constraints. 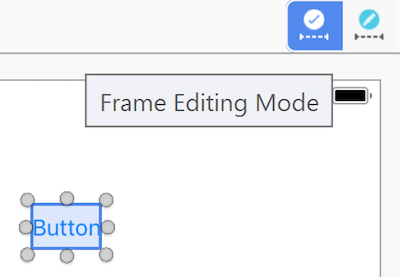 In constraint editing mode, clicking this button adjusts the constraints of any selected elements to match their frames. When expanded, the bottom toolbar displays all devices, orientations, and/or adaptations applicable to the current document. Clicking them changes the view displayed on the design surface. Note that selecting a device and orientation changes only how the iOS Designer previews the design. 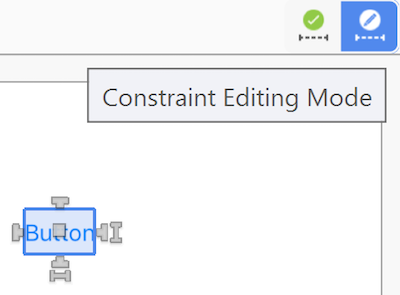 Regardless of the current selection, newly added constraints are applied across all devices and orientations unless the Edit Traits button has been used to specify otherwise. If iPhone SE / Portrait, is selected, the popover will provide options to create an interface variation for the compact width, regular height size class. If iPad Pro 9.7" / Landscape / Full Screen is selected, the popover will provide options to create an interface variation for the regular width, regular height size class. These controls adjust the zoom on the design surface. They do not affect the user interface of the application at runtime. Widget – The main properties of the control, such as name, class, style properties, etc. Properties for managing the control’s content are usually placed here. Layout – Properties that keep track of the position and size of the control, including constraints and frames, are listed here. Events – Events and event handlers are specified here. Useful for handling events such as touch, tap, drag, etc. Events can also be handled directly in code. The Identity section of the Properties Pad now shows a Module field. It is necessary to fill in this section only when interoperating with Swift classes. Use it to enter a module name for Swift classes, which are namespaced. Many properties in the Properties Pad show no value or a default value. However, the application's code may still modify these values. The Properties Pad does not show values set in code. Many properties in the Properties Window show no value or a default value. However, the application's code may still modify these values. The Properties Window does not show values set in code. 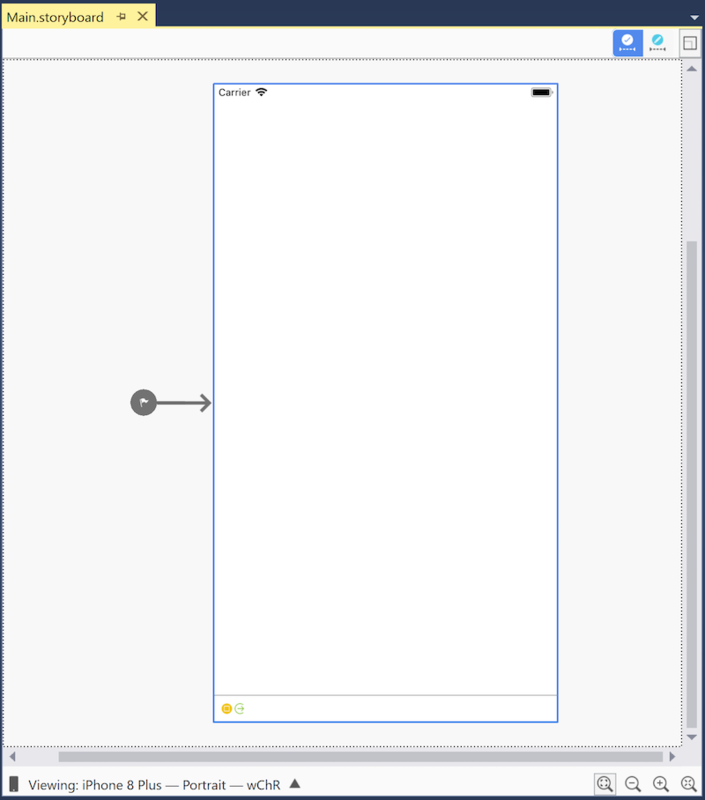 Note that after an event handler has been specified in the Properties Pad, the iOS Designer will immediately open the corresponding code file and offer to insert the method declaration. For an example that uses custom event handlers, refer to the Hello, iOS Getting Started Guide. The selected control in the outline view stays in sync with the selected control on the design surface. This feature is useful for selecting an item from a deeply nested interface hierarchy. 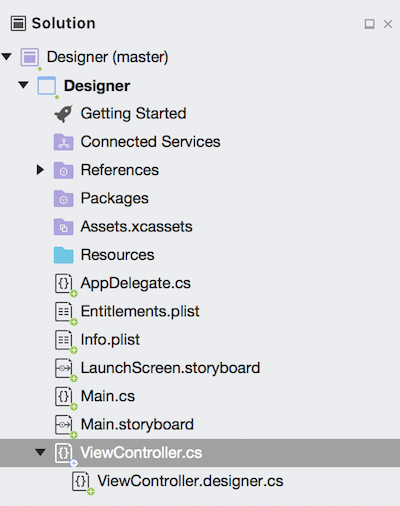 After making edits in Xcode Interface Builder, save the file and return to Visual Studio for Mac. The changes will sync to the Xamarin.iOS project. The iOS Designer supports creating, editing, and managing .xib files. These are XML files that respresent single, custom views which can be added to an application's view hierarchy. A .xib file generally represents the interface for a single view or screen in an application, whereas a storyboard represents many screens and the transitions between them. There are many opinions about which solution – .xib files, storyboards, or code – works best for creating and maintaining a user interface. In reality, there is no perfect solution, and it's always worth considering the best tool for the job at hand. That said, .xib files are generally most powerful when used to represent a custom view needed in multiple places in an app, such as a custom table view cell. For more information regarding the use of storyboards, refer to the Introduction to Storyboards. 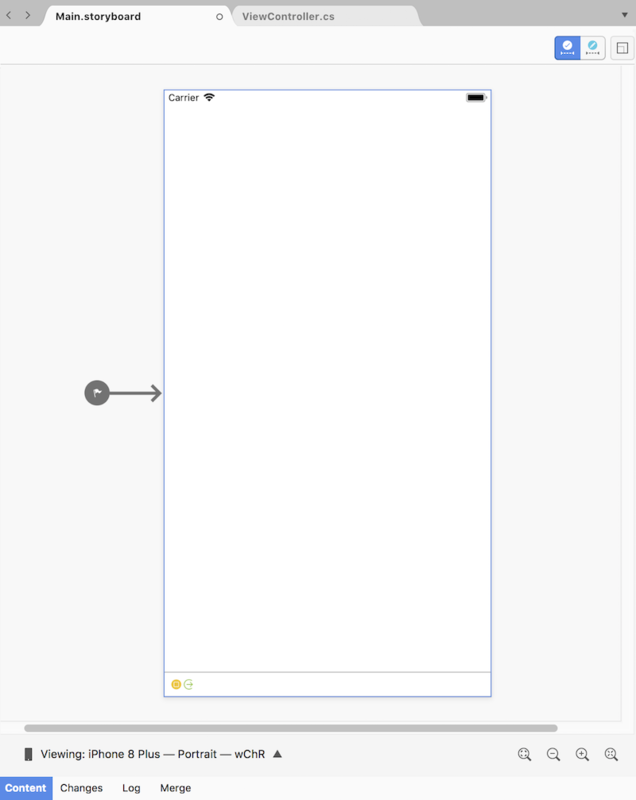 This and other iOS Designer-related guides refer to the use of storyboards as the standard approach for building user interfaces, since most Xamarin.iOS new project templates provide a storyboard by default. This guide provided an introduction to the iOS Designer, describing its features and outlining the tools it offers for designing beautiful user interfaces.